We are so pleased to be working with youth homeless charity Depaul UK in 2019, supporting them from the proceeds of sales from our new range of Greek style yogurts – The London Collection. Pictured at the launch last week are our Managing Director Chris Timotheou and Annie Hall, Corporate Partnerships Manager for Depaul UK, holding some of the new yogurts. These have been very well received in the superbly welcoming cafe area at Depaul HQ, Sherbourne House, in Bermondsey, south London. The partnership for 2019 reflects the shared values of both brands, from their London histories through a strong joint belief in integrity, quality and aspiration – and even shared anniversaries! We celebrate 70 years this year and it is Depaul UK’s 30th year as a UK charity. You will find their logo on the front and the underneath of the vibrant new pot sleeves. Depaul work to empower young people affected by homelessness in London to move on to better lives. We identified early on in our business that investing in our team would help the company succeed. Tims Dairy and Depaul plan to work together this year on events that will raise joint awareness. 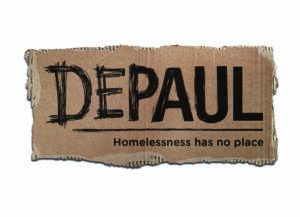 Please discover more about Depaul and how you can help too.